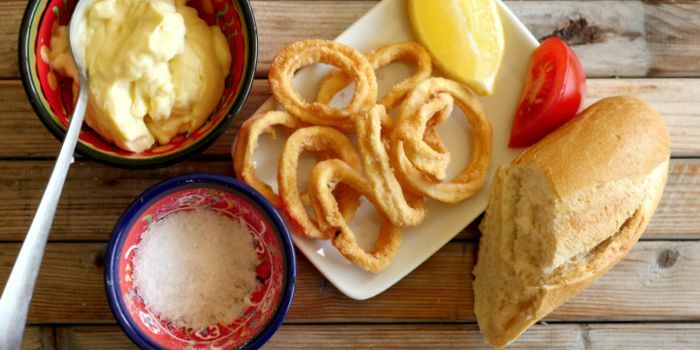 Calamari always reminds me of Mediterranean holidays, and of our time living in Madrid. Fried squid rings are great as a starter or as a snack in a chunk of crunchy baguette. Some people suggest soaking the squid in milk for 1-8 hours, This is meant to tenderise it, but I'm not sure it does. Others suggest that if the squid is frozen and then defrosted it will become tender. Again, I'm not sure - I reckon quick cooking and eating straight away are your friends here. I'm assuming for this that you have ready-cut squid rings. Rinse them under cold water and pat them dry-ish - not too dry or the coating won't stick. Mix the two kinds of flour together with the salt and paprika. In a large cooking pot, heat 50-75mm (2-3 inches) of oil to 180°C (356°F). You don't want to overcrowd the pan, so cook your calamari in batches. Dredge each batch of squid rings in the flour mixture, and cook for 1-2 minutes until golden. Drain well and pat dry on kitchen paper. Serve with a wedge of lemon, garlic mayonnaise and some crunchy baguette. The video above is from the Keef Cooks YouTube channel. Click here to see the video recipe of Calamari / Deep-fried Squid Rings on YouTube. Vegetable or sunflower oil for frying. Lemon wedges, garlic mayonnaise, coarse sea salt to serve.